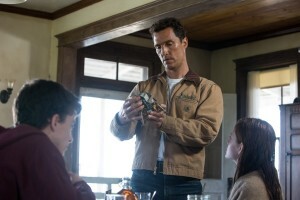 Left to right: Timothée Chalamet, Matthew McConaughey and Mackenzie Foy in INTERSTELLAR. ©Paramount Pictures / Warner Brothers Entertainment. CR: Melinda Sue Gordon. 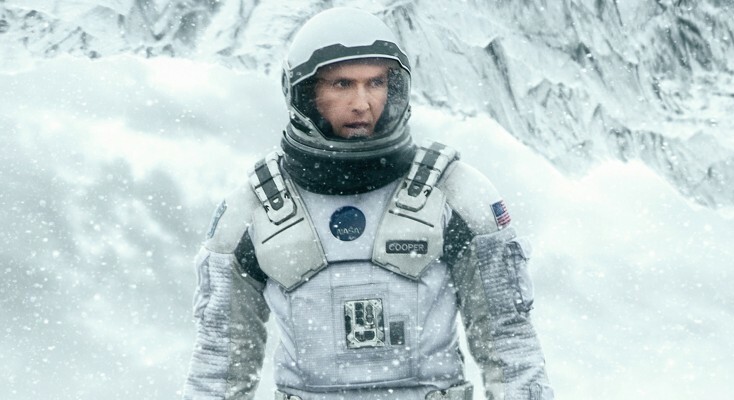 Bloated with self-importance, slathered with sappy sentimentality and saddled with an eye-rollingly unsatisfying ending, “Interstellar” is a tiresomely tedious trek that reaches for the stars but misses by light years. Clocking in at nearly three endless hours, the virtually fun-free film wastes far too much of that time stuck on a crop-blighted, dust-storm-dismal future Earth. The field of broken dreams rural countryside there may have seen its last okra crop (horrors! ), but there’s still plenty of more than one kind of corn. Matthew McConaughey drawls, sweats and meaningfully stares his way through this ordeal as Cooper, a frustrated former pilot reluctantly grounded in a post-prosperity America that now needs farmers more than engineers. Upstairs in daughter Murphy’s bedroom, books begin falling off of shelves and light beams form patterns that give Cooper the coordinates to a secret surviving NASA base in the middle of nowhere. Those In Charge there apparently are satisfied to wait around for potential space jockeys to drive up to their locked gates in the middle of the night, instead of actively recruiting guys like “best pilot we’ve ever had” Cooper for a program that they’re hoping will save the human race from imminent extinction. Government at work, folks! Soon Cooper, snarky Amelia Brand (Anne Hathaway) and a couple of disposable crew members blast off for a Saturn-adjacent wormhole portal to planets that could be potential new homes for homo sapiens. They are accompanied by what may be the most awkwardly impractical looking robots ever created: rectangular black slabs that crutch along like clumsily mobile versions of the “2001” monolith. Honestly, it’s hard not to wonder how much the blocky things would mark up floors. They aren’t the movie’s only clumsy constructs. We’re supposed to believe that Cooper’s worshipful and science-loving young daughter Murphy (Mackenzie Foy) goes into such an enduring snit over darling dad’s departure that she refuses to send him any video messages during his years-long journey. Cooper is given to mouthing aphorisms such as, “We’re explorers, pioneers, not caretakers,” and “Once you’re a parent, you’re the ghost of your children’s future.” Brand’s straight-faced hypothesis that love might be a higher-level dimension isn’t laughed off as a pothead-variety pronouncement. One of the movie’s hospital deathbed scenes is unintelligible, and what happens in another is insultingly unbelievable. And without giving away any spoilers, the final act is one logic-leaping disappointment after another. For a movie that seemingly wants to look smart, this one sure turns out to be dumb. Director Christopher Nolan, who cowrote the screenplay with brother Jonathan and is best known for his grimly joyless “Dark Knight” Batman trilogy, gets credit for not releasing the movie in 3D. Sadly, however, much of the movie ends up looking as unnaturally dark as films viewed through those annoying glasses anyway. For anyone paying premium ticket prices, shifts between standard widescreen and the squarer IMAX format are distractingly noticeable. There also are too many uninteresting in-flight scenes that look as if they were shot from an unmoving camera affixed to an outer hull, so that most of the frame is taken up by the side of the static ship itself. The score by frequent Nolan collaborator Hans Zimmer has two modes: overbearingly pompous church-organ chords, and “Koyaanisqatsi”-clone Philip Glass figures. The otherwise chilly movie’s emotional subtext about Cooper’s strained relationship with his daughter transcending time and space is heavyhanded, never moreso than when Cooper goes on a crying jag that feels out of place, unconvincing and Oscar-baiting. Plot points about relativity-related time dilation, using gravity as a space-travel slingshot and Our Hero somehow managing to single-handedly swipe a starship won’t be new to any SF fan, but familiarity isn’t the movie’s main drawback. There are a couple of okay special effects scenes, such as one featuring a monstrous rising wave on a watery planet, and solid clouds that mirror the glacier surface of another. But it’s hard not to wish that a movie with a soaring title like “Interstellar” and a plot in which the fate of the entire human race is at stake wouldn’t turn out to be so dopey and deadly dull.